I've joined some Ning.com groups: SayWhy?, As a Mom, and TeamSarah to name a few. Ning is the Swiss Army Knife of social media. Anyone can sign up and create a social network for whatever topic appeals to them. It's kinda like a topically focused Facebook or MySpace without the large user-base that those have attracted. In each Ning group to which you belong, you have a "My Page". It's a space for you to blog, post pictures and video, read comments that others have left for you, and monitor discussions that you're participating in. As a content creator, I have (almost) no interest in adding content to any Ning group. Doing so feels like I'm putting information in a shoebox because only members of the group will be able to see the content. That kind of communication is valuable to each group, so, if you blog or add other content to a Ning group, please don't take my criticism personally. Everything in my photo feed gets posted to my twitter feed; however, my non-photo posts to Twitter are more opinion, re-tweets, and other content retreads. So I decided to scratch my Twitter feed from the list above. Now I needed to figure out a way to shoe-horn those feeds into all of my Ning "My Pages". I noticed that there was an RSS (Really Simple Syndication) widget at the bottom of the left column on all "My Pages". The syndicated content from my feeds needed to be front and center, so I dragged the RSS widget from the bottom of the left column to the top of the center column. Next, I tried adding my three feeds: my blog, YouTube channel, and TwitPic photo feed. That didn't work because you can only have one RSS feed. I poked around a bit and finally hit on Yahoo's Pipes. Pipes is a tool for aggregating RSS feeds. It's got a helpful graphical interface for choosing RSS feeds and how to mash those feeds into your new aggregate feed. Below is the picture of how my content is assembled. You may want to click on it it get the big picture before I explain what's happening. Here's what's happening above. The three Fetch Feed widgets are getting my three content feeds: Reboot Congress, YouTube channel, and TwitPic photo feed. These are mashed up in a Union. The output of the Union is then piped through a Sort. The Sort arranges each syndication item—each blog post, YouTube video, and picture I upload to TwitPic—in descending order by publication date. In English, it puts my most recent content at the top. Finally, the output of the Sort is wired to the Pipe Output to create my aggregated feed. 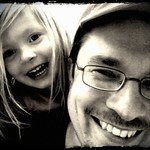 Next, I added my new RSS feed to my AdSense account to try and make a buck—I can dream... The link was a little cryptic, so I added it to Feedburner to get the more readable link: http://feeds.feedburner.com/pipes/RebootCongress. Almost all of my YouTube content is duplicated on my blog, so I'm thinking about taking my YouTube channel out of the aggregate feed. It's pretty easy to do. 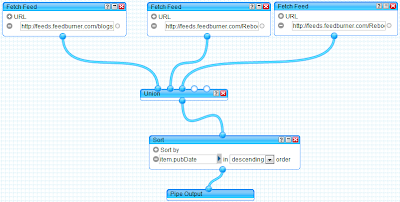 Just login to Yahoo Pipes, delete the appropriate Fetch Feed widget, and save the changes. I think that adding AdSense advertising has slowed down the feed. I might remove that. Some Ning groups just don't display YouTube videos at all. I think that is a function of the web page template used for the Ning group. Maybe I'll figure out how to fix that someday. Maybe not. As a Mom has over 50,000 members and they're planning to move off of Ning to something better suited to such a large organization. FWIW, TeamSarah has almost 75,000 members, so I wonder what they think of Ning. As a Mom's move will be a painful process. They've sent out emails warning members that some content (like the member's blog posts) will be lost. I've dodged that bullet with the strategy described above. Let's say that you're looking at losing your blog posts. How can you save them? Well, keep in mind that I've chosen to blog out in the open where as Ning groups, like As a Mom, are closed. Consider your audience and your content. Hopefully, you'll determine that your content is appropriate to a wider audience. If that is the case, then you should consider setting up a blog on one of the many free blogging services. This blog is hosted on blogger/blogspot. Take a look at WordPress, Live Journal, or any of the other developer hosted blogging platforms. Once you've chosen a platform and setup your account on that platgorm, copy all your posts from your Ning account over to your new blog (yes, one at a time, one picture at a time, etc. It'll be painful.). Most blogging platforms allow you to schedule posts; therefore, you can retain the timestamps on your posts by manually scheduling your copied posts with the timestamps they have in As a Mom/Ning. If you have questions or suggestions, please leave them in a comment! I need your help sort it out in my brain. Let's talk.